We’re PolyDome East – Your east coast distributor of PolyDome products. 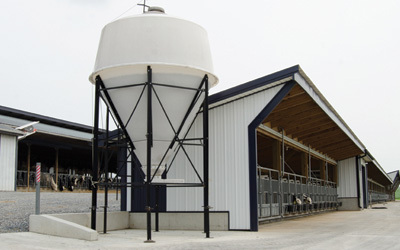 PolyDome features polypropylene products for use in raising farm animals such as huts, hutches and nurseries for calves and cattle, lick tanks, bulk bins, and silo accessories. The rotomoulding process uses hollow metal moulds and a powdered polyethylene plastic that becomes liquid under high hieat. The moulds with the liquid plastic inside are spun on both vertical and horizontal axis to form a uniform thickness, or skin on the outside walls, thus the name rotomoulding. The mould is removed from heat and allowed to cool under controlled conditions to avoid shrinkage or warpage. The resulting polyethylene plastic is resistant to impact, most corrosive chemicals and temperature extremes. The slippery surface makes it very easy to clean. Polyethylene is also environmentally friendly because it can be recycled. PolyDome has their own metal fabricating shop for frames, stands, and supports used with their agricultural products. All metal parts are powder coated for corrosion resistance. 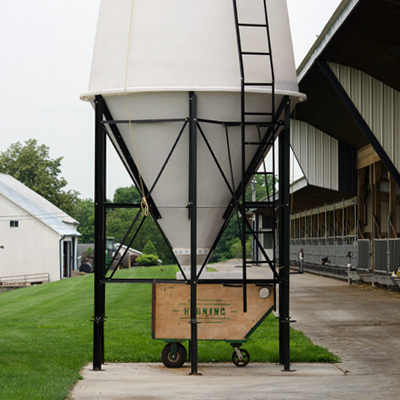 PolyDome Bulk Bins are the perfect choice for handling high-moisture corn, soybeans, and other granular materials. They are made of high density polyethylene which will never rust or corrode. PolyDome Bulk Bins will always remain clean and attractive. Raising calves is no easy chore! 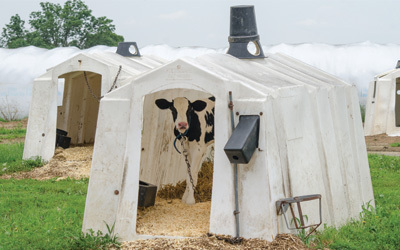 But dairy herdsmen everywhere have discovered the benefits of raising their calves in Poly Dome Calf Nurseries. During the day, the bed pack absorbs sunlight. This stored heat keeps your calves warm at night. necessary to become high producers. Use your Poly Dome throughout the year with an eight-inch bedding. Open the unit and use outside pens in July and August to prevent heat problems. Keep the calves closed-in September through June. The PolyDome Calf Warmer provides a comfortable environment for newborn calves for the first few hours after birth. The top section is hinged, and removable, for calf entry. The PolyDome Calf Warmer comes complete with a deluxe, highperformance, 110 volt heater. 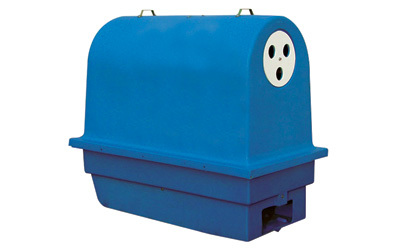 The entire unit is made of medium density polyethylene for long-lasting durability and easy cleaning.